This 2100 sqm purpose built financial institution is located in Salmon Arm, BC and is designed as a flagship branch for enhanced community banking services throughout the greater Shuswap region. The project’s predominant use of wood and wood building systems was primarily devised as a means of offsetting the carbon footprint of the project and allowed the project to utilize a very local labour pool of carpenters, trades, and skill that contributed directly to the local manufacturing, supply chains, and economy. 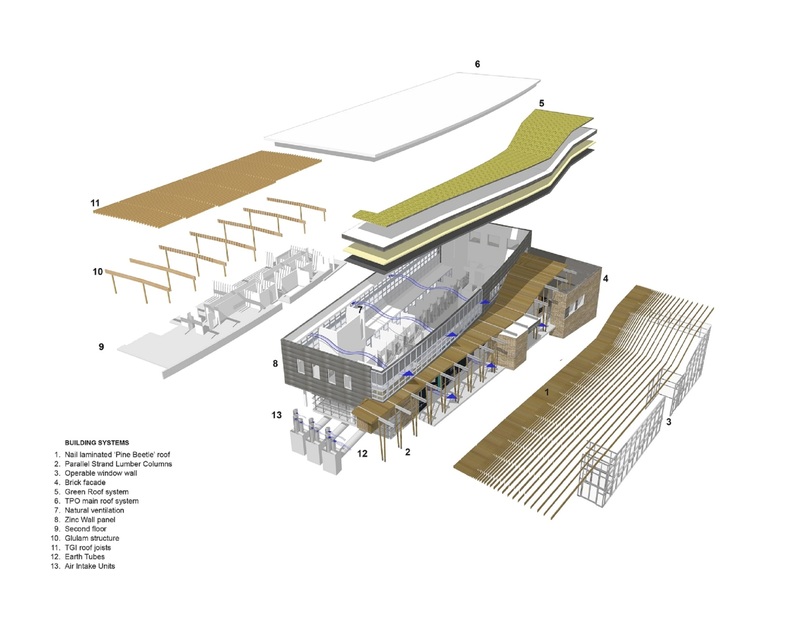 The design concept sought to connect the building and its function to the greater community through subtle references to the natural and man-made context of Salmon Arm and introduce sensible and realistic sustainable design goals and targets. A large sweeping atrium space and angular roof are direct references to the famous pier in Salmon Arm, and surrounding topography and provides a unifying design element across the north elevation. The main atrium roof structure is composed of PSL columns and Pine Beetle nail laminated timber roof. The use of wood was instrumental in the project. The Main Atrium is a 220 sqm nail laminated timber roof made of pine beetle reclaimed wood, supported by a system of PSL Columns. The entire second floor and roof structural framing utilizes innovative wood structural systems of glulam columns and beams and TJI joists systems. All interior framing of walls, partitions, soffits, parapets were composed of 100 % wood framing. Challenges arose through the complex geometries of the main atrium roof and innovative structural requirements it presented. Collaboration with local authorities to ensure all seismic and fire code challenges were met as well as integration with other building systems. A strong collaborative relationship with all project stake holders sharing a common vision to maximise the use of traditional and contemporary wood systems to fulfill project goals. The physical building design is based on three pillars – People, Place, and Planet. 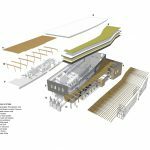 The use of wood ties together this ambition by engaging the local supply chain and skilled labor force, referencing the local landscape and manmade context as well as projecting sensible and realistic sustainable design goals. Wood as a primary building component was favored in this project, tapping into a comprehensive local manufacturing supply chain with advanced wood products, a skilled labor force and a pursuit of woods natural sustainable advantage. Availability of quality materials, leading to short lead times on deliverables, cost effectiveness, woods inherent structural and natural beauty as a finished material further spoke to its desirability as a design solution. Wood as a sustainable resource and contribution in offsetting the carbon footprint of this project was a key design strategy focused on the lifecycle of the building and part of a broader design strategy to maximise energy efficiency achieved through the integration of building systems including passive earth tubes and a 220 sqm Green roof. As part an integrated design solution focused on sustainable principles as set out in this project these ideals are transferable to projects of varying scale and typology. Identifying the use of wood as a means to not only speak to the natural characteristics of British Columbia and introduce sensible and realistic sustainable design goals and targets, contemporary wood products enabled the design team to utilise the material to produce an expressive, structurally complex building form as a cost effective design solution. An inherent connection to the material and longstanding relationship to its use as a building material further enhance its suitability as a building material in British Colombia. It’s outright use as both a structural and finish material expressed vividly in the most public component of the building relate publicly how traditional materials can exist within contemporary architectural expression.